A new mural is brightening the halls and spirits at Fox Chase Cancer Center. The colorful painting of three large sunflowers stretches across a wall between the Hospital and Center buildings, and extends out into a peaceful corner of the courtyard. A brilliant red cardinal – a representation of a loved one who has passed away – a few small ladybugs, and some words of inspiration, complete the mural. 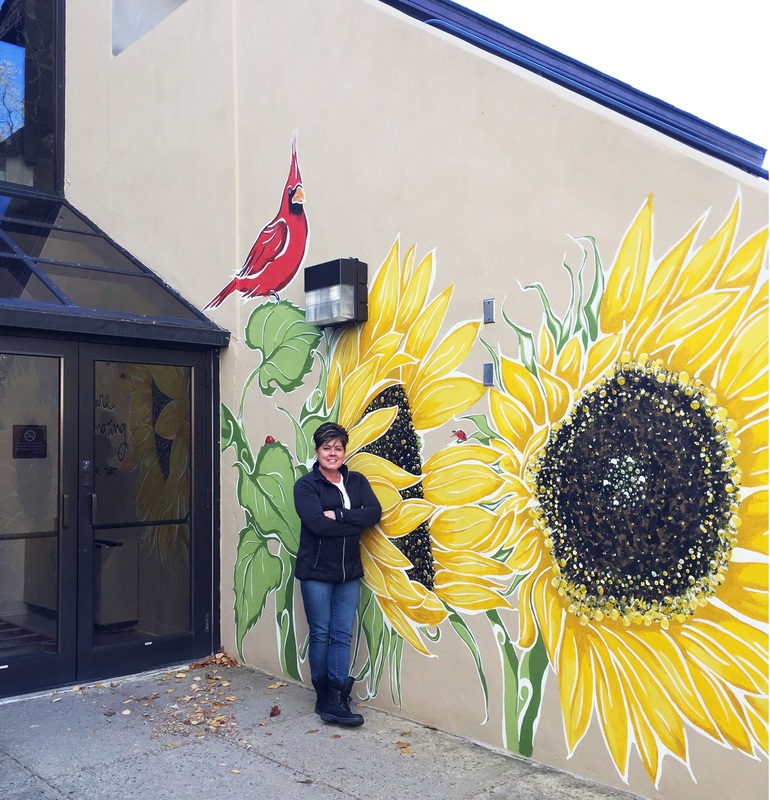 Artist Loraine Dunn, an ambulatory care representative at Fox Chase, painted the beautiful mural over the course of two weekends with the support of the Friends of the Hospital of Fox Chase Cancer Center. Since its founding in 1969, Friends, which is comprised entirely of Fox Chase employees, has donated more than $4 million to Fox Chase to support patient comfort and care. They have purchased items such as blanket warmers, wheelchairs, and inpatient room noise machines in addition to contributing to upgrades to the hospital chapel and surgical waiting room. In fiscal years 2016 and 2017, the group funded the Art Committee, to create an environment that enhances the patient, visitor, and employee experience. The mural is one example of how the committee has created a more peaceful and cheerful environment. Though the mural is brand new, it’s already catching the attention of employees and patients.